Can You Book a Friend Using the Club Carlson Free Award Night? Love your blog, thanks for all the points you’ve helped me get! I have a little Club Carlson tip for you in case you didn’t already know. I just made a 2 night reservation (using points from my Club Carlson account) for a friend, so the guest name is not my name. As a result of the guest name not matching my Club Carlson account name (or not matching my Club Carlson Visa name), the 2nd night was NOT free like it usually is. So I called Club Carlson and the rep kindly fixed the reservation so the 2nd night would be free. So it is possible to get the 2nd night free when booking Club Carlson with points for a friend, you just have to call Carlson and ask for it. This is an interesting tip! One of the best perks of the Club Carlson Premier Rewards card is the free night when you book 2 or more consecutive award nights. On a 2-night stay, it’s like getting the room for half the number of points! But according to the terms and conditions, the Club Carlson Visa cardholder must be traveling to get the free award night! So did Bill just get lucky? Club Carlson Premier Rewards cardholders get their last night free on award stays of 2 nights or more. That’s a great deal, and 1 of the reasons I have 2 of these cards! Club Carlson includes Radisson, Radisson Blu, Park Inn by Radisson, Park Plaza, and Country Inns and Suites hotels. Your account must be open and reservation must be in the Club Carlson member’s name and use the member number associated with your account to be eligible for the Bonus Award Night. As a Club Carlson Visa card member, you qualify for one Bonus Award Night redemption during your stay! The Club Carlson member must be traveling to qualify. 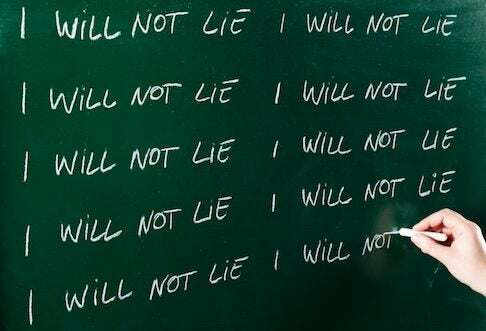 There IS a workaround, but it’s not exactly what Bill described! The Club Carlson representative I spoke with confirmed that to get the free night on an award stay, the Club Carlson cardholder’s name needs to be on the reservation. But folks CAN book a room for an authorized user on their Club Carlson Visa card. According to the representative, they can get the free night if you call to make the reservation at 888-288-8889. Unless Bill’s friend was an authorized user on his card, I suspect he just got lucky with an agent who may have been willing to bend the rules. Or perhaps they made a 1-time exception. Sometimes you can get a deal just by being nice and polite! You could try to book the hotel under your own name (as a Club Carlson cardholder), then add a 2nd guest name to the comments section of the reservation. Then, your friend could check in “before you.” This method works for some hotel chains, but it could be risky. 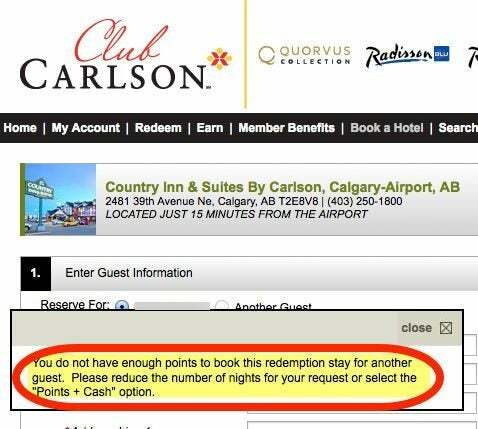 Because the rules say the Club Carlson cardholder must be traveling, there’s a possibility that a hotel employee might insist on seeing the cardholder and/or card. Million Mile Secrets reader Bill reports he was able to book a friend’s award stay through his Club Carlson account. 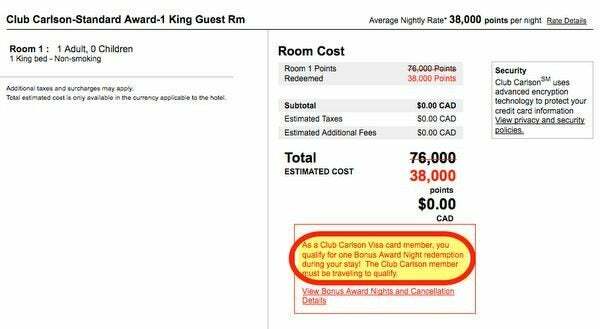 By calling Club Carlson, his friend got the free award night on a stay of 2 nights or more usually only offered to Club Carlson Premier Rewards cardholders. It sounds like Bill ran into an extra-nice phone agent! It’s not unheard of for hotel and airline representatives to bend the rules. Club Carlson confirms that only Club Carlson cardholders qualify for the free award night perk. But authorized users can also get the benefit, as long as you call to make the reservation. Have you been able to book friends or family and get them a free award night using your Club Carlson account? Please share your experiences in the comments! Would using this trick allow you to book more than 2 nights using one card if you had an authorized user? Book night 1 and 2 with primary and book night 3 and 4 using authorized user? Then keep alternating for even longer stays? I have done this before for family, but it was for a hotel that is not far from my home. I booked the room for family members, and checked them into the hotel myself. in my experience (both my spouse and myself have separate accounts/cards) when we wanted to travel with another couple we used this solution. 6 day stay and did it in this order. Both of us booked day 1 and 2 as two separate awards. Then booked days 5 and 6 as two separate awards. Then had to book days 3 and 4 as separate awards (don’t remember if they was two 1 night awards or one 2 night award – did not get the second night free on the middle 2 nights). So paid for 4 nights with points and 2 for free – did get room upgrade and breakfast for both rooms. If both my wife and I are club carlson card holders, can we do alternate booking for 6 days? First 2 days in my name, days 3-4 in wife’s name and days 5-6 in my name again? This way we could spend points for 3 days for 6 days stay.